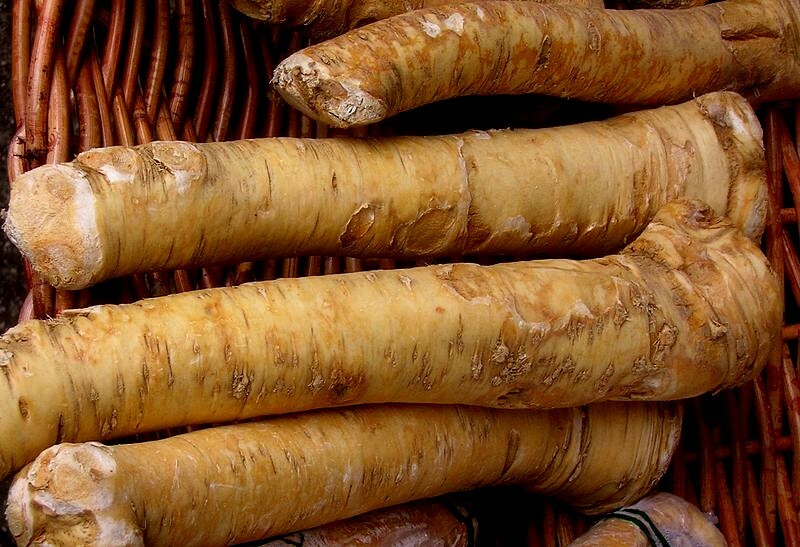 Horseradish roots and their juice have high nutritional value and immense health benefits. The horseradish plant belongs to Brassicaceae family, and species Armoracia rusticana. Horseradish is a perennial plant. It grows up to five feet (1.5 meters) and has long, white, tapered roots. Its edible medicinal roots and their juice are traditionally known for many health benefits. It is one among the cruciferous vegetables (broccoli, cabbage and Brussels sprouts) known to contain glucosinolates. Glucosinolates are precursors to antimicrobial and antitumor compounds like allyl isothiocyanate and indoles. Intact horseradish roots do not have any aroma. When the roots are cut or grated, a glucosinolate (sinigrin) present in the juices from the damaged cells is degraded by the enzyme myrosinase into a mustard oil (allyl isothiocyanate). Allyl isothiocyanate has a typical pungent odor. On exposure to air and heat, the cut roots loose their pungency and become dark with unpleasant bitter taste. They are mixed with vinegar to keep their quality and health benefits. Traditionally horseradish roots and their juice are being used as medicine for treating a number of health conditions and ailments. In herbal medicine, horseradish juice is used for treating sinusitis, bronchitis and urinary tract infections. Its juice is used as rubefacient and rubbed on skin to stimulate blood circulation below the skin for relieving pains. Another health benefit is that its juice is a diuretic. Culinary benefits include use in sauce, salad and soup preparations. Horseradish is rich in vitamin C and also contains selenium, potassium, calcium, magnesium and phosphorus. It also has dietary fibers, particularly soluble fibers. Glucosinolates, sinigrin and gluconasturtiin (phenethylglucosinolate), present in root juice impart many medicinal health benefits to horseradish. The extracted glucosinolates in fully developed roots contain 83% sinigrin and 11% gluconasturtiin. Research studies have substantiated the use in herbal medicine for antimicrobial health benefits. Goos KH, Albrecht U and Schneider B. in their research studies compared treatment benefits of the herbal drug containing horseradish root juice with standard antibiotics. They found that herbal drug containing horseradish displayed a clear advantageous safety profile and benefits when compared with standard antibiotics in treating acute sinusitis, acute bronchitis and acute urinary tract infection. Further it is found that horseradish root juice inhibits the development of antibiotic resistance by bacterial biofilms and multidrug-resistant bacteria. Jakobsen TH et al (Department of International Health, Immunology and Microbiology, University of Copenhagen, Copenhagen, Denmark.) found in their research studies that iberin, an isothiocyanate produced by horseradish exhibited the highest activity in blocking the bacterial communication, also known as quorum sensing (QS), which is essential for development of drug resistance in bacteria. Allyl isothiocyanate (AITC) present in horseradish roots and its juice has antitumor properties. Zhang Y. (Department of Cancer Prevention and Control, Roswell Park Cancer Institute, Buffalo, NY 14263, USA) in his research studies "Allyl isothiocyanate as a cancer chemopreventive phytochemical" concluded that "Bioavailability of Allyl isothiocyanate is extremely high, as nearly 90% of orally administered AITC is absorbed. Overall, Allyl isothiocyanate exhibits many desirable attributes of a cancer chemopreventive agent, and further studies are warranted in order to elucidate its mechanism of action and to assess its protective activity in humans." Hence there is a great possibility of horseradish roots juice having a greater role as a cancer preventive agent. Horseradish should not be consumed in excess as it can irritate the gastrointestinal tract. People with peptic ulcers and children below four years should avoid horseradish juice. The enzyme horseradish peroxidase, present in the root juice has extensive research benefits in molecular biology and biochemical research fields. Severe hypothyroidism - side effects of hypothyroidism. Amla juice - Health benefits. Barley grass - Barley grass juice health benefits. 2. Zhang Y. Allyl isothiocyanate as a cancer chemopreventive phytochemical. Mol Nutr Food Res. 2010 Jan;54(1):127-35. Horseradish roots juice health benefits.